A team of researchers with Deakin Medical School's Metabolic Research Unit have taken the unique approach of combining two unusual pharmaceuticals – extracted from cannabis and vitamin A – with the ultimate aim of developing a drug to treat obesity. "The results of our study show, for the first time, that particular compounds in cannabis and vitamin A can work together to reduce the deposit of lipids (fats)," said Dr Yann Gibert, the Head of the Metabolic Genetic Diseases Research Laboratory. "This finding opens up exciting opportunities to potentially treat obesity without the need for invasive surgery." 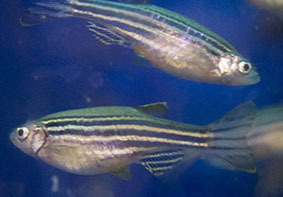 The researchers used zebrafish and human cells to test the effect of the Endocannabinoid system (an active compound of cannabis which plays a role in appetite regulation and fat formation) and the Retinoic Acid Pathway (an active component of vitamin A) on reducing the deposit of fat. "The complementary actions of the Endocannabinoid system and Retinoic Acid Pathway in reducing fat deposits have the potential to treat obesity in a safer and more effective way than if they were used independently," Dr Gibert said. "This approach only focusses on fat, and avoids effects on the brain, which has been a concern in previous research involving cannabis." Dr Gibert said that it is well known that the cannabis system regulates appetite, but, previously, adverse effects have prevented use of the drug in humans for medical purposes. His research has found a way to potentially remove these side effects by using the two systems in combination, and at a lower dosage. While this study has demonstrated that these two pathways can work together during fat accumulation, the way this happens is unclear. Dr Gibert said that the next step for the team will be to test the drug's effectiveness further, and identify any side effects. "If there are no side effects, new therapeutics could be ready for human use within five years," he said.